Haven’t tried it yet, but looks very easy to use and fun! I will be using this again. My students and I love this activity! A classroom favorite. Can’t wait to use it again this year! Thanks for creating such a fun resource! Used this during the last week of school before Winter Break, and my students loved it. Will definitely purchase more of these activities. Thanks for the great resource! They love escape rooms! They love Christmas! Great way to keep them learning! I love these escape room activities! Thanks! Fun resource during Christmas season! I use these as a fun surprise in library/tech block, and it’s my students favorite! Thank you. Very fun and engaging for students! Thank you! LOVE! LOVE! 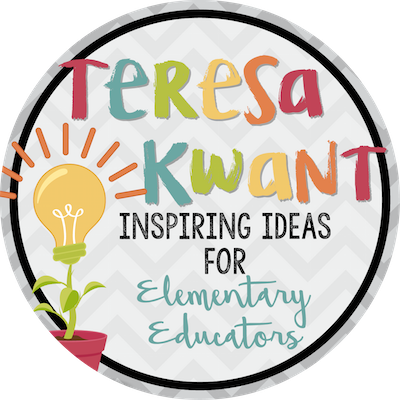 LOVE these resources!!! My kids really work hard on these! Students were so excited to participate in this activity. They worked hard and got a good review in at the same time. Great fun and academic activity for the day before holiday break! My students love these activities! Please keep them coming!! Another great activity! Love Cracking the Codes!! This was a lot of fun for my 5th graders! Easy for students … Great review…engaging. These are great to review skills students should know. It took me a little while to figure out the set-up. The pictures were very helpful. My kids loved doing this the week of Christmas. My kids ALWAYS love these activities! I have purchased a few different sets. This was a great activity! Kept my students fully engaged. It will take some time to put together for the first time. After that, it is easy to start! Great activity for the week before Christmas, while still practicing our CC math standards! Thanks! This was the perfect activity for math for the last day before Christmas break. Engaging and self-paced, the students loved it in small groups! Very thorough and helpful instuctions to follow as well. Looking forward to adding this to my curriculum! I don’t have enough words to describe how awesome this activity was! The kids loved it and were so engaged the entire time. I’m looking forward to using the other versions the rest of the year. My students absolutely loved this activity!!!! My kids absolutely adored this activity. AWESOME! This is the second “Crack the Code” game my class has done and they loved it! A great activity to review what has been taught and to do before winter break! This was hands down my 5th graders favorite activity! It was perfect for them! They loved it and didn’t even think about the fact that they were doing work! Thanks. I’m beyond excited to try this with my kids and increase student engagement and learning! The topics covered were perfect! My kids were begging me just today to get more of the scavenger hunt!! They love it! They don’t even realize they are learning!! My 5th graders loved this! They can’t wait to try another one! Awesome resource that promotes collaboration and teamwork while reinforcing math skills. Thank you!! This was so much fun! I loved seeing my class transform into a team to solve this puzzle. I just wish my students could keep the envelopes organized so I could do small groups. Thank you!! 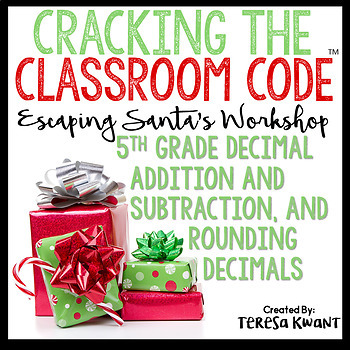 This was such a fun activity to do with my 5th graders the week before Christmas Break. The kids loved the escape room theme and did not even realize that they were reviewing decimal concepts! The students had a lot of fun with this! This was my first escape room and putting it together was a lot but the directions were thorough enough even my students were able to help me reorganize afterwards. My students loved the challenge and really worked hard! Thank you! Fun way to get kids up and moving! Thank you for sharing your work. Loved this! My kids loved it, were extremely engaged and it was very grade level appropriate! Easy setup 🙂 Thank you! Wish I had found it earlier and was able to use it this year….plans for next year. This is an amazing product! It takes a little while to set up, but once you get the hang of it, it is just a matter of “time to assemble”. Clear some space on your coffee table, put on movie, and you’re good to go. This is the third “Escape Room” I’ve purchased because I love them so much. The kids do to! It doesn’t just encourage cooperation, it demands it. The problems are just right for a mix of learners, and make an excellent review of a topic. I will be purchasing more of these in the future. My students are so excited for the next one! Wow! My class had a blast doing this challenge and it channeled their energy during the last week before break! Thank you so much for the awesome product! Great math review! They students do not even realize they are learning! So much fun! Would love more reading comprehension ones. My class loved this activity! A wonderful resource! This fits perfectly into my Grade 5 math unit. It’s great to have a tie to Christmas! Thank you! Love these cracking the codes. This is so well set up and I cannot wait to use it next week! Kids loved the first one, looking forward to watching them work together to solve the puzzles. I am saving this for the week before break! I hope the kids love it! These products are THE best! My class and I LOVE them. Super engaging! I will be prepping this activity this weekend. I look forward to using it to review in December! Thank you! I teach in a 4th/5th grade class and your resources are perfect for review and practice for my 5th graders and an opportunity for my 4th graders to learn from their 5th grade partners. This looks great. I cannot wait to use them with my class. I know it’s going to be a tremendous help. Thank you for sharing! I am so excited to use this the last week of school before break! This will be a great way to review some skills while having a lot of fun! Thanks so much! Great resource! Keep making them! My students love doing these! I have all of them! My students loved the Save the Turkey division game, so I can’t wait to play this with them! Thank you for making it so easy to put together! I teach 4 math classes and don’t always have a lot of time to reset the game in between classes, but this has been very easy to organize. The students I work with enjoy doing these. Thank you! GREAT, can not wait to get this prepared for my classes to use this before Christmas! My students loved the Halloween Cracking the Code project. I immediately had to get my hands on all of the 5th grade products. I’m excited to use this project next month.